Ummm, can I go out and say, best carrot cake ever?! Plus, not only is this cake delicious, it’s super pretty too! Which you guys know is something I’m all about. If something can be pretty AND taste good, well that is just a major bonus for me! 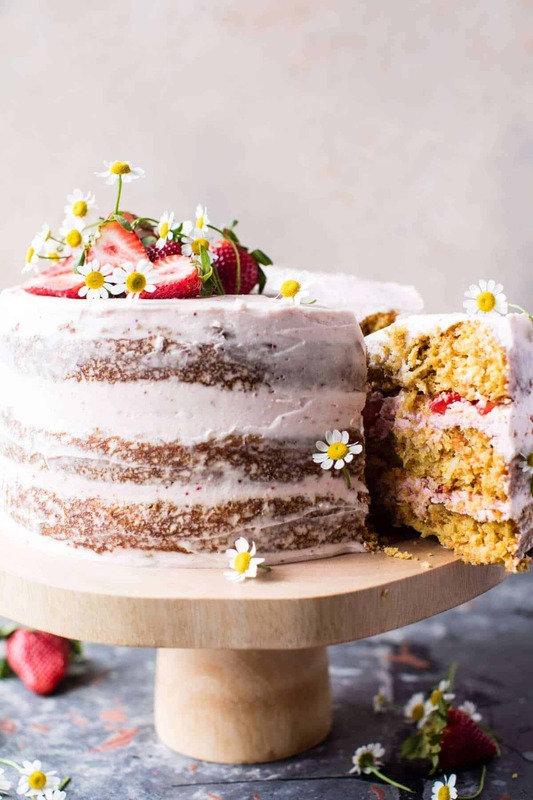 This cake is the perfect way to be kicking off the weekend, right?! YES. Which by the way, hey, hi! Happy Friday! I feel like I just jumped right on into things here with some serious cake details, but as I’m sure you’ve noticed, I am a little exited about this recipe! OkOK, and the fact that it’s Friday just adds to the excitement! Anyone else totally ready for an awesome weekend? It was a long but great week over here. I love that my weeks are jam-packed and feel really productive. All the more reason to end with cake and celebrate just a little! <–smart reasoning, trust me. Here’s the deal, with Easter right around the corner, I am definitely in the baking mood. When I think about Easter eats, I think of ham, lamb, asparagus, pineapple, carrot cake, milk chocolate bunnies and strawberry filled desserts. Reading that sentence out loud, it sounds like a complete random mix of foods, but I dunno, those are just traditional Easter eats to me. What do you think of when thinking about your Easter menu? Anyway, carrot cake is a classic. Thing is, you guys know that I’m typically all about chocolate cakes. I mean, the more chocolate the better! DUH. I only recently started getting into baking fruity desserts, and while I will not deny that I don’t love them same way as say, something like this chocolate cake, I’m still loving having fun with them, and this cake is no exception. Hello, the whipped mascarpone buttercream alone is reason enough to bake this one up. 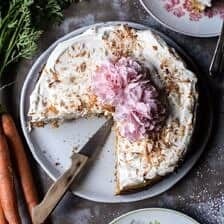 The idea of carrot cake has always sounded a off to me, but then last year I finally made a carrot cake cheesecake and my view on carrot cake changed forever. Not only do the carrots add major moistness to the cake, but the sweet flavor they give off is very good. 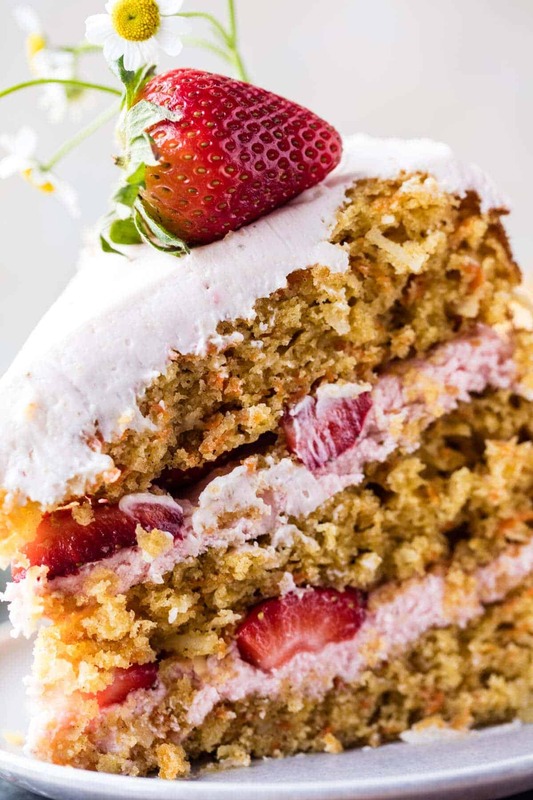 The base layers for this cake are made of vanilla cake, flavored with cinnamon, carrots and tons of sweet shredded coconut. The coconut is probably my favorite part. It lends a really nice sweet, almost tropical flavor, to the cake that pairs really well with the strawberries in the frosting…which oh my gosh, this buttercream (or frosting, I never really know whether to call it frosting or buttercream, but I like buttercream), my mom says you could top off just about anything with this buttercream and turn it into something so delish. 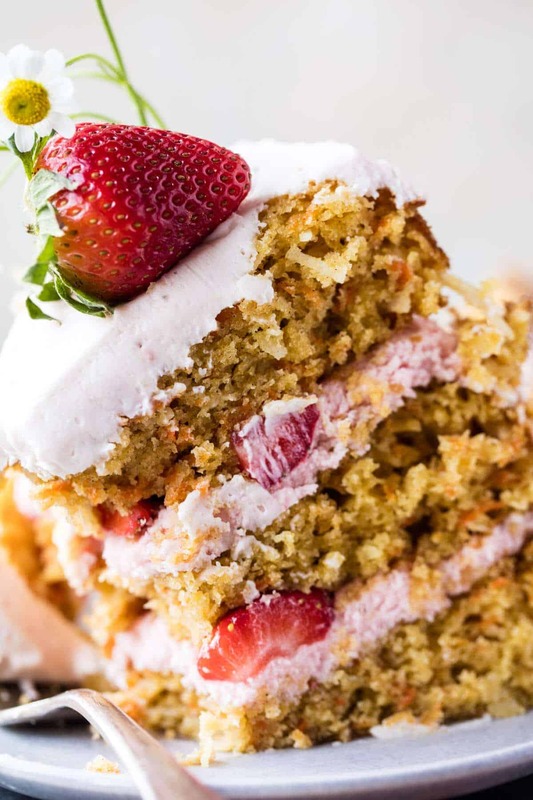 It’s pretty traditional for carrot cake to have a cream cheese frosting, but I loved the sound of strawberries and mascarpone together, so I went for it…such a good idea. Especially paired with the super moist and coconutty carrot cake layers. It’s kind of like Italian cake meets carrot cake. Promise, it’s all things awesome and perfect. 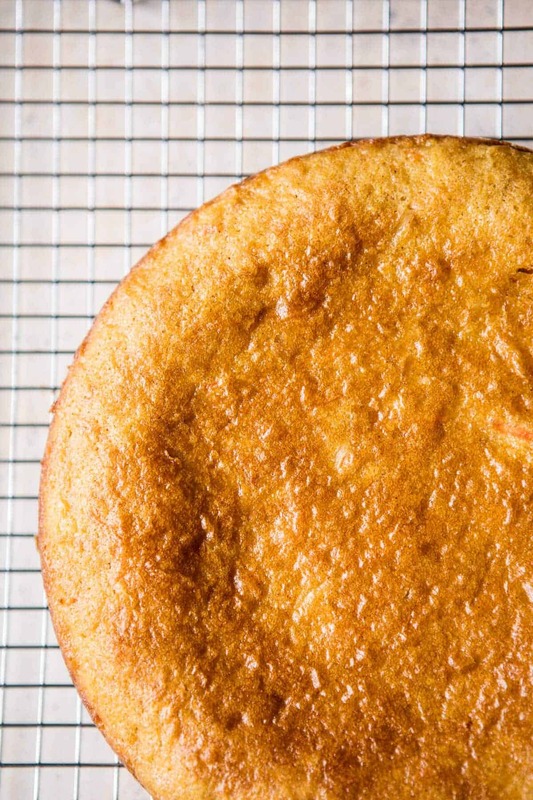 While the cake looks all fancy, it’s actually pretty easy to make. Simply bake the cake layers, make the buttercream, frost the cake and DONE. Nothing complicated about it, which is great for any kind of holiday dessert. OH, and while the chamomile flowers are optional, I love the pretty spring touch they add, and yes, they are edible! This cake would be perfect for Easter or Mother’s Day, but also makes for a great weekend treat. I don’t know about you guys, but this week has left me feeling the need to celebrate its end with cake. Long work days and dealing with some online haters means cake is for sure a good idea…but then, cake is always a good idea! 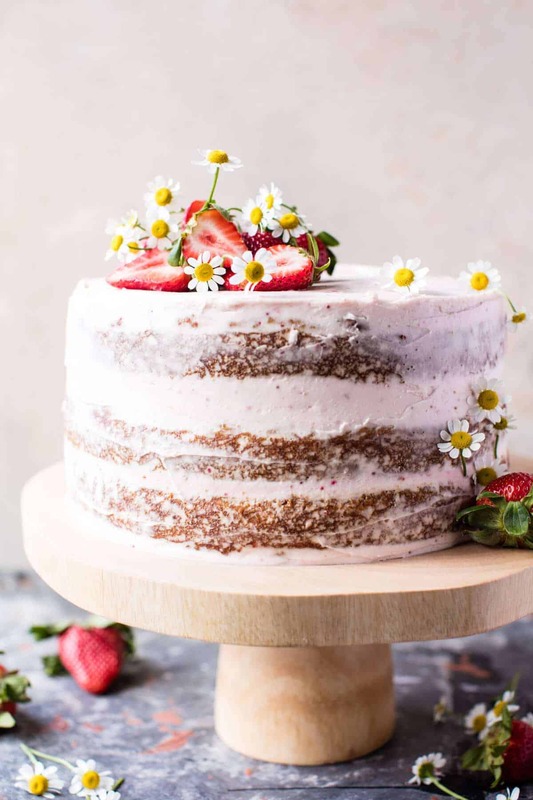 This beautiful cake is easier to make than you think! 1. Preheat the oven to 350 degrees F. Grease three 8-inch round cake pans. Line with parchment paper, then butter/spray with cooking spray. 3. In the bowl of a stand mixer (or use a hand held mixer) beat together the canola oil, buttermilk, eggs, sugar, brown sugar, and vanilla until smooth. Beat in the carrots and coconut. Slowly add the dry ingredients to the wet ingredients with the mixer on low until there are no longer any clumps of flour. Batter should be pourable, but not super thin. 4. Pour the batter among the 3 cake pans and bake 25-30 minutes, until the tops are just set and no longer wiggly in the center. Remove and let cool five minutes, then run a knife around the edges of the pan and turn the cakes out onto a cooling rack. Cover and let the cakes cool completely before assembling. 5. To make the frosting, add the cream cheese and butter to a large mixing bowl. Using an electric mixer beat until the mixture is light and fluffy, about 2 minutes. Add the powdered sugar and vanilla. Beat another 2-4 minutes or until the frosting is light and fluffy. Beat in the strawberry powder. 6. Place one cake layer on a serving plate or cake stand. Spread a little frosting. Top with half the strawberries. Repeat with the remaining 2 cake layers. Be careful not to over fill your layers with fruit. Frost the cake sides. That cake slice right there, it is to die for! So, can I have a slice now? It looks soooooo delicious! Ah I wish I could share!! Do you think I can put in less oil? I want to make this a bit more healthy. What do you think? You can use half oil and half applesauce. Let me know if you have questions. Thank you! You don’t have to convince me, cuz clearly this IS the best carrot cake ever! What a brilliant and unique idea to add strawberries! Thanks Tori! I just thought it needed something sweet! It’s so interesting that American and European cakes seem to be different in proportion of dough and cream. I have the impression that American cakes have always more dough than cream while in Europe (or at leat Germany) it’s more balanced. Hmmm, I honestly do not know. Sorry I could not help more! It’s official- Everything you do is better! This looks amazing!! Looks delicious!! I can’t imagine using 3 tsp. of baking powder and 3 tsp. baking soda??? I can see 1 tsp. baking soda with the baking powder. Sorry you have to deal with haters. I can’t understand why people just do not read the blogs they don’t like. CRAZY!! Must be jealous!! Thanks so much for catching that! Recipe is fixed!! Wow! This looks so good, I might go make it right now. Beautiful piece of work. I can’t wait to try it! Oh this looks incredible! Our family recipe for carrot cake uses coconut as well- love the combo… and looks/sounds even more delicious with your other additions! (Any suggestions if freeze dried stawberries are unavailable?) Have a great weekend! Hmm, the freeze dried strawberries work really in the frosting because they don’t add extra moisture. Is is possible to order them online? Here are some on Amazon, does this work? Sorry if this is trouble for you! Let me know if you have questions. Hope you love the cake! By one cup of freeze dried strawberries do you mean the equivalent to one cup of strawberries being .5 oz of the freeze dried? Because if it’s a cup of freeze dried that’d be like 4 of those packets of the link you posted ok Amazon. Just a little confused! Something happened to my comment. It vanished. This looks delicious. Never would have though to put strawberries with carrots. I am a bit concerned about how much baking soda it calls for. That seems like a lot with using baking powder too. 3 tsp. of each???? Hey Jen!! You can just omit the coconut from the recipe. The cake will still be great. Let me know if you have questions. Hope you love this and happy Easter! Awh congrats! That will be so fun! I hope you enjoy! Looks great! Do you need to refrigerate these (the leftovers?) Also, any thoughts on making as cupcakes?! I would keep the leftover in the fridge becasue of the mascarpone, but bring to room temp before eating. And I think cupcakes would be awesome! I think this recipe would make around 32 cupcakes and I’d bake for 12-15 minutes probably, but I can’t say for sure since I have not tested the recipe as cupcakes. Hope you love the cake! 🙂 Let me know if you have questions. This looks amazing. Do you think it could be made into cupcakes? I think cupcakes would be awesome! I think this recipe would make around 32 cupcakes and I’d bake for 12-15 minutes probably, but I can’t say for sure since I have not tested the recipe as cupcakes. Hope you love the cake! 🙂 Let me know if you have questions. canola oil is a cooking and baking oil. If you can’t find it, try using butter, but I like using oil best. Let me know if you have questions. What on earth??? Mascarpone on carrot cake is brilliant and WITH strawberries??? Are you serious?! This is out of this world delicious looking. 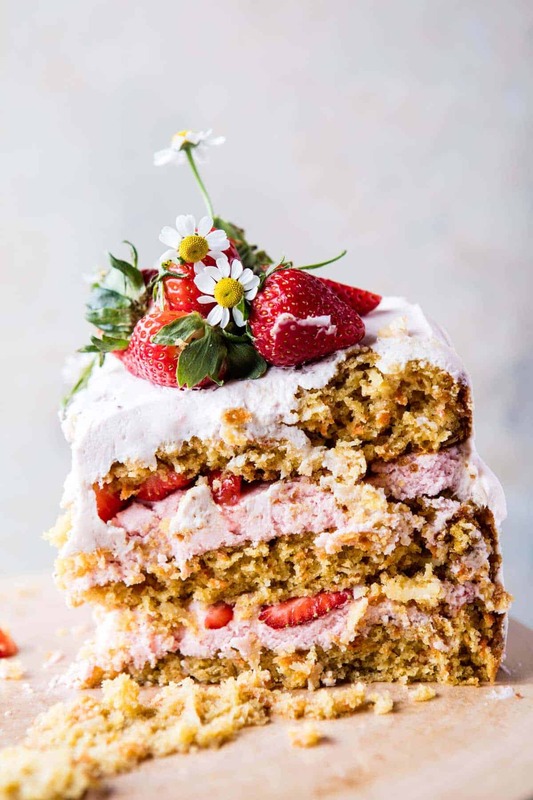 I never ever would have thought to put strawberries with carrot cake, but mascarpone and strawberries are amazing together and mascarpone and carrot cake would be amazing togethers, so if we use mascarpone as our flavor “glue” (frosting pun not intended…teehee), why on earth wouldn’t the whole combination work???!! YUM!!! Perfect for Easter. Yes, bring on the carrot cake! 🙂 This is just stunning! I love this one Tieghan! What a great combo of the carrot cake and the strawberry buttercream. Perfect cake for Easter! So happy you think so Mary Ann! Hope you enjoy it on Easter! Can I get recipes in metric. Love to have a go. Hi David, I don’t feel comfortable converting this. I believe there are online calculators that can help. sorry I was not helpful. Great recipe😀 . Can I used melted butter instead of canola oil? And if so how much butter should I use? Thank you so much for this beautiful recipe. This cake looks amazing and Delian. I was wondering can strawberries be substituted with raspberries? (Not sure I ever seen dried raspberries though). I’m allergic to strawberries. 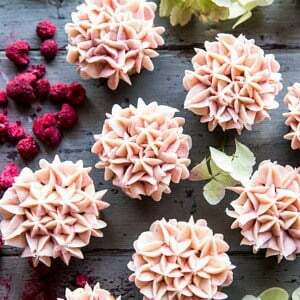 Raspberries will be awesome and I have seen them dried before and I know you can get raspberries dried on amazon too (link below). Let me know if you have questions. Hope you love the cake! Love it, Tieghan! Desserts with mascarpone rock! Your cake is beautiful! Thank you so much Julia! I am so happy you like this! Thanks so much Kim! I am so glad you like the addition of mascarpone and strawberry!! This is gorgeous and so creative, and I have to make it soon. The end. WHERE DO YOU COME UP WITH ALL OF THESE FLAVOR PAIRING IDEAS? I am seriously jealous of your creativity. Thank you Jenny!! Cooking all day long with lead you to different things haha! Also- any chance you tried this with coconut oil or coconut milk? I’m sure these would intensity the coconut flavor in the BEST possible way. 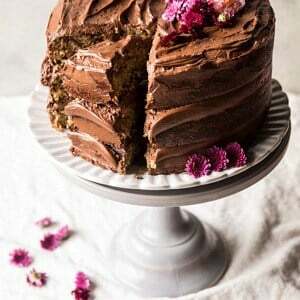 Any idea on how to make this into a 2 layer instead of a 3 layer cake? Reduce the recipe by 1/3? Yup! Just reduce by 1/3. That will be great. Hope you love the cake! I made this cake yesterday…greatness! It is a most make spring cake. I am so glad you enjoyed it Micheal! Thank you!! What a delicious and beautiful cake! This recipe looks absolutely scrumptious and beautiful! 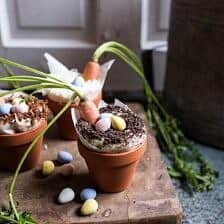 I’m planning to make it for Easter but was wondering if it would be ok to make it the day before? Should I just leave it out of the fridge in a cake Tupperware until the next day to serve or should it eaten the same day? Its hard to find shredded sweetened coconut in the UK, what would you suggest as a substitute? Do you think desiccated coconut would work as a substitute? Hi Calvin! Yup, desiccated coconut will be great. Let me know if you have questions. Hope you love this! Thank you and happy Easter! I am SO excited to make this beautiful cake for Easter on Sunday!! Yay, hope you love it and have an amazing Easter! 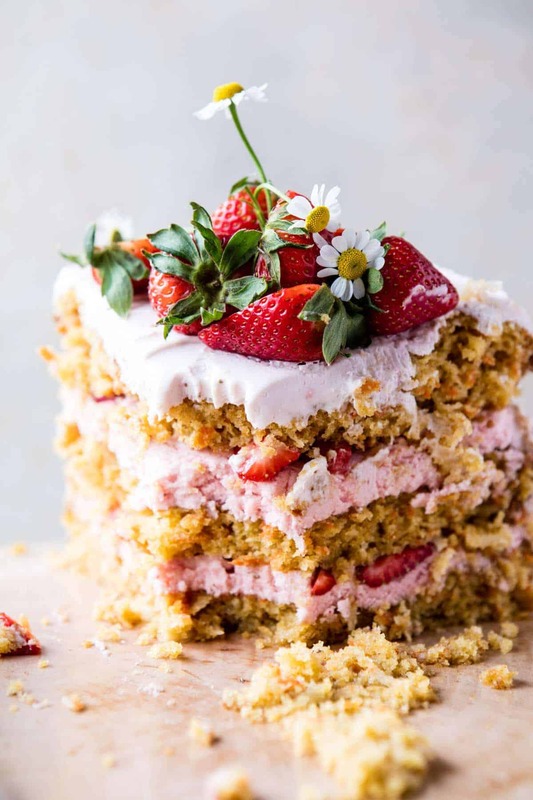 strawberry coconut cake – now that is something I should definitely try. Thanks for posting.. I don’t bake much so I just want to make sure – is it 1 cup of freeze dried strawberries and then grind, or grind enough to to make 1 cup of powder? I’mean sorry if this is a dumb question, but I’m not very experienced. Thanks! Not a dumb question! 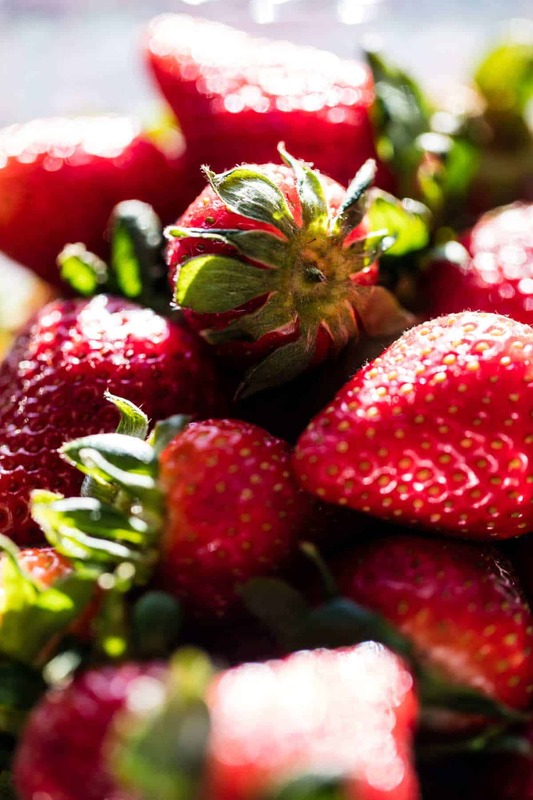 You need 1 cup of freeze dried strawberries. That should come to about 1/2 cup of powder. Let me know if you have questions. Hope you love the cake! Made this the other night for a house warming! I’ve never made a tiered cake before and bought a smaller tin (oops) and it wasn’t nearly as beautiful as yours…but it all went so that’s when ya know it at least tasted good! I’m so happy you made it! I’m sure it was amazing!! Thank you Kari! by mistake i only used two pans…. will this mess up the cake? I am not sure, but I hope it all worked out! Hey Donna! 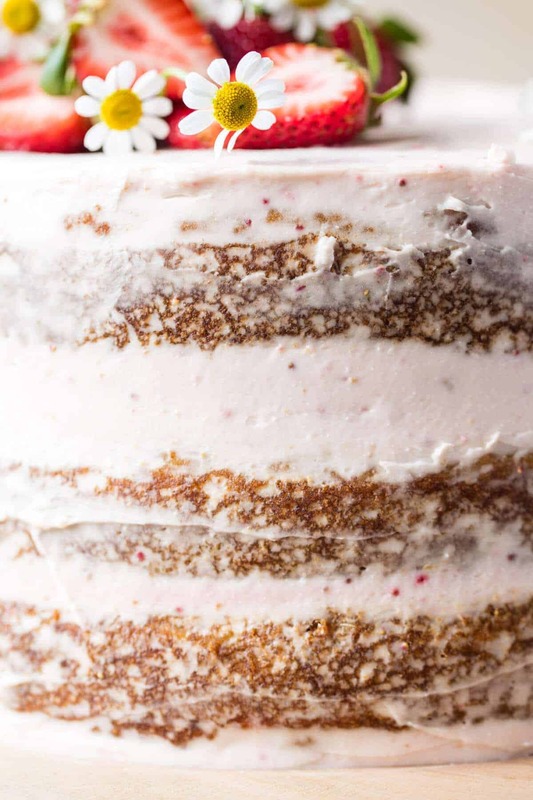 For the frosting, is everything at room temp? that is very important. It’s helps the butter and mascarpone cream together nicely. Make sure to completely cream the cream cheese and butter together before adding the powder sugar. This will insure no lumps. I hope that helps! Let me know if you have questions and happy Easter! Just popped this cake in the oven! Making this for Easter dinner and I can’t wait for everyone to try it. I have shamelessly tasted the batter so I know it’s going to be AMAZING! Ps: I cannot wait to buy your new cookbook! Does anyone have any suggestions for making this beautiful cake Gluten Free and Low Carb?? Thank you! Hi! I have not tried this as a gluten free cake so unfortunately I don’t think I can help much. I do love bob’s red mill gluten free flour blend if that helps at all. I made this tonight and it was fantastic! I followed the recipe and it came out perfectly! Imagine?! 🙂 🙂 Thank you for all your amazing recipes and your gorgeous pictures. This website makes me so happy!! Thank you so much Meridith! What do you think of using coconut flour instead of normal flour.. ? Any advice on that? Thank you for all you do .. keep inspiring! This cake is amazing, i made it this weekend for our annual Easter party, it was a hit..i will be making this many times. I did sub out the mascarpone cheese for cream cheese because i had a brick of cream cheese. I may try it next time with the mascarpone to see if i taste a difference. Made this for Easter and it was a huge hit with my family. Delicious! Very easy to make, and looked amazing! I’ll certainly make it again. I also made this for Easter brunch and it was a showstopper! Sorry no photo to show but it was so pretty. Ended up using frozen strawberries in the frosting (which I pulverized) as I misread the recipe but it turned out great. This is my third of your cakes I have made and they are the best. Thanks! Hi, this cake looks amazing. I’m in Australia and not to sure what a stick of butter is. Can you tell me how many grams that is please? This cake looks amazing! I can’t wait to make it! How do you measure your flour? Scoop and sweep? I’d love it if you’d start sharing your recipes with weight measurements! Thanks for always having the best recipes!! I made this for Easter. It was so delicious and fun to serve. I loved the coconut. I happened to be in a dollar store and they had dried strawberries and they were great! It was meant to be. Thanks for your blog. My favorite! Whoa! How perfect! So happy you liked it Susan, thank you! YUM! I just made this for my Sister’s Birthday and it was a huge hit. I found some edible flowers to decorate the top and it was so festive! Sounds so fun Kathryn! So happy you liked it! Hi! This cake looks amazing! I’m going to make it this weekend for my birthday party, I can’t wait to try it! I have one question though: I live in the Netherlands and can not get freeze-dried strawberries anywhere, I can’t order them either. Can I substitute it with anything or is it better to just leave it out? Thanks! Hi Katja!! You can either leave them out or use 2 tablespoons strawberry jam. Let me know if you have questions. Hope you love the cake and happy birthday! Greetings from Sweden and keep up the good work! Hi! Sorry for the delay in my response. You can use regular whole milk in place of the buttermilk. Let me know if you have questions. Hope you love the cake! Made this cake with some healthier modifications, used almond meal, avo oil, cashew milk and a little less sugar. Cream cheese for the frosting. Basically I wanted to make this really badly so used what I had at home. OMG!!!!!! Sooooooo Good!!! Thank you for all your beautiful creations, I always look forward to your instagram posts. All the subs sound amazing! So happy it was yummy! Thank you for making it Rachel! Yes the cake was really Fantastic!!! We amused our party with this fantastic cake, Thanks for sharing this awesome recipe. Thanks alot!!! That is amazing! Thanks Rajiv! I was recommended to check out your website by a friend, I really like the “authentic feel” in your pictures. Best of luck to you! Oh and yes, I can;t wait to try out this cake. My nephews will love it!! Thank you! I am so glad you are liking my blog! I love epic balloon backdrops, but sometimes you just want something quick and easy with the same payoff. Wow incridable , i will try make it this friday , but i have a question when you sift the flour before measure or after mix with dried ingrediance ? I really love strawberry coconut carrot cake. And you have made it with buttercream, it’s really going to be awesome in taste.You have really done a nice job. As you have shared the best things for me. Even this recipes can be made in busy time also. It’s really special for me. thanks for sharing it here on this site. I made this cake last night for a party at work and I can honestly say I’m amazed! Followed the recipe and it worked out well. Thank you! Can this be premade? Maybe just the layers and stored in an airtight container a day or two before and then frosted the day of serving it? Does the layers need to be refrigerated? Any tips would be great! I want to make this for Easter But need to make it a day or two before. I made this recipe into cupcakes (we had a spring potluck at work and didn’t want to bring a whole cake) and they turned out great! The frosting has a lot more butter than the strawberry cream cheese frosting I usually make, but that meant it was fluffy & piped beautifully. I couldn’t find freeze dried strawberries, so I used about a cup of chopped & mashed strawberries, along with a couple spoonfuls of strawberry jam, to make the frosting. That is such a great idea! I am so glad this turned out amazing for you, Lauren! Thank you! This is a great recipe! I had never used freeze dried strawberries in buttercream before and was very pleased with both the color and texture of this frosting. Thanks so much for sharing this recipe! Thank you so much Heather! I am so glad this turned out amazing for you! Amazing cake! This was my first time baking a cake and I made it in our motorhome and it still came out fabulous! Was a hit for Easter brunch. Thanks HBH! Will definitely make this again. So moist and flavorful. The frosting was to die for. I made his cake for our Swedish Midsummer party and everyone went crazy over it. My favorite carrot cake recipe so far. One suggestion: I used Mascarpone for the icing, but the recipe doesn’t call for salt. I added a teaspoon or so of salt to give it that cream cheese frosting taste. Not sure if you make it this way or not? But it was so good! Hi Tina! I am so glad you loved this recipe!! Thank you! Delicious! I made it for my son’s 1st Birthday party. I think it’s the first time I had no leftovers (I would have loved some too). 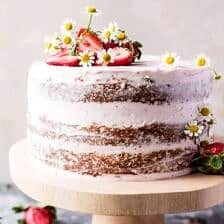 Though your version is beautiful, I opted to leave out the strawberries as they weren’t in season and it was still one of the best cakes I’ve ever made. I am so happy to hear that! Thank you so much Katie! Hi there! How much would 2 sticks of butter be in grams? We don’t have sticks of butter in South Africa, only tubs. Thank you! Made this cake for Easter, and it was a HUGE hit! The cake was super moist and the strawberry frostings with fresh strawberries complimented the cake perfectly. I’m looking forward to trying some of your other recipes. Thank you! !